Our product range includes a wide range of foam net for glass bottles. Backed by our hard-earned experience of this industry, we are engaged in offering an excellent quality Foam Net for Glass Bottles. The offered foam net is manufactured by our personnel using high grade raw material and modern techniques keeping in pace with industrial norms. 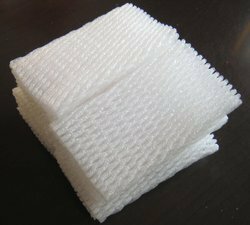 Our foam net is used by liquor and glassware manufacturing industries as a protective packaging. This foam net is quality by our quality inspectors on several parameters in order to supply flawless range to our customers. Looking for Foam Net for Glass Bottles ?